Height: males 23-28 in., females 22-27 in. Weight: males 70-90 lbs., females 60-80 lbs. What is the origin of the Bouvier des Flandres? 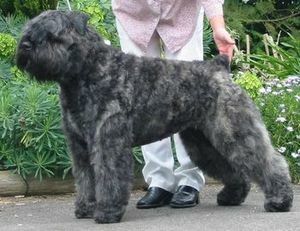 What does the Bouvier des Flandres look like? 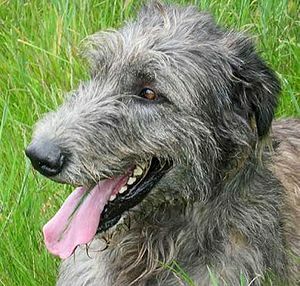 Bouviers are powerful dogs with short bodies, 23-28 inches tall and weighing 60-90 lbs. depending on gender. The head is flat sporting a thick beard, mustaches and eyebrows. the ears are set high, triangular and erect if docked. Eyes are oval-shaped and dark brown. The short, docked tail is carried erect. The coat is harsh, medium to long. Colors are fawn, gray, black, brindle and salt and pepper. The coat should be combed twice a week and clipped or stripped every 3 months. What is the temperament of the Bouvier des Flandres? The Bouvier is an intelligent dog, devoted to its family. They want to please their humans and train easily. 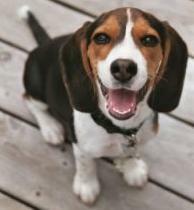 They can be domineering so consistent, positive training will reward you with a well-behaved dog. Bouviers are suspicious of strangers and can be aggressive with other dogs. They are very good companions to children. Bouviers need a vigorous jog or walk and playtime daily. They can adapt to apartment living if exercised regularly. 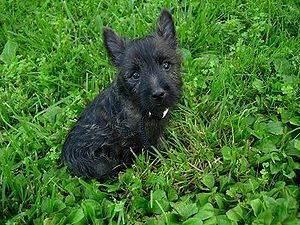 What is the Bouvier des Flandres used for? They were used to herd cattle and still do. They are excellent guard dogs and have been used for police work. Bouviers are very loyal, protective companions. Hypothyroidism, hip and elbow dysplasia, sub-aortic stenosis (narrowing of area under aortic valve causing blockage of blood flow through the heart), glaucoma.